Landmark Construction has named Kevin Brennan, Nevada City resident, as president of the $75 million privately owned, public works general contracting company based in Loomis, CA. Joe Bittaker, former president, is now chairman of Landmark Construction as of April 1, 2018. Brennan joined Landmark Construction in 2006 as Senior Project Manager and Estimator and was promoted to the role of Vice President of Preconstruction, and then Vice President of Operations, during his tenure. 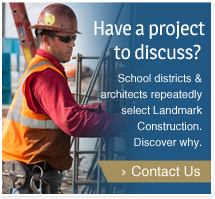 He has served as Project Executive for many of Landmark’s most important projects, recently completing The Bayshore School’s new $30m two-story urban campus in Daly City. Prior to joining Landmark Construction, Brennan worked in the industry for 16 years managing multiple large public works projects such as the Ronald Reagan Washington National Airport Expansion in Arlington, Virginia. As a multiple Ironman Triathlete, serious back-country skier, competitive mountain biker and avid kayaker, Brennan will continue the Landmark Construction culture that celebrates adventure while meeting challenges and offers employees many opportunities to build comradery as they challenge themselves athletically and enjoy the outdoors.